Bio-eye Orbital Implants become a "living" part of the patient's body. 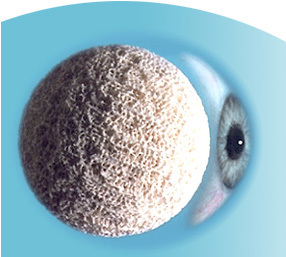 The Bio-eye Orbital Implant has the longest track record of all modern implant materials. There are implants made in Europe of artificial hydroxyapatite that are not the same in structure, composition or quality. There are also porous implants of porous polyethylene, (Medpor), and of aluminum oxide, (Bioceramic). These are not natural materials of the body and do not have the same, completely porous, micro architecture as human bone or as the Bio-eye implant. The choice is yours. You need not settle for less than the best. Your choice of orbital implant will affect your appearance for the rest of your life. Read on to understand the full story.